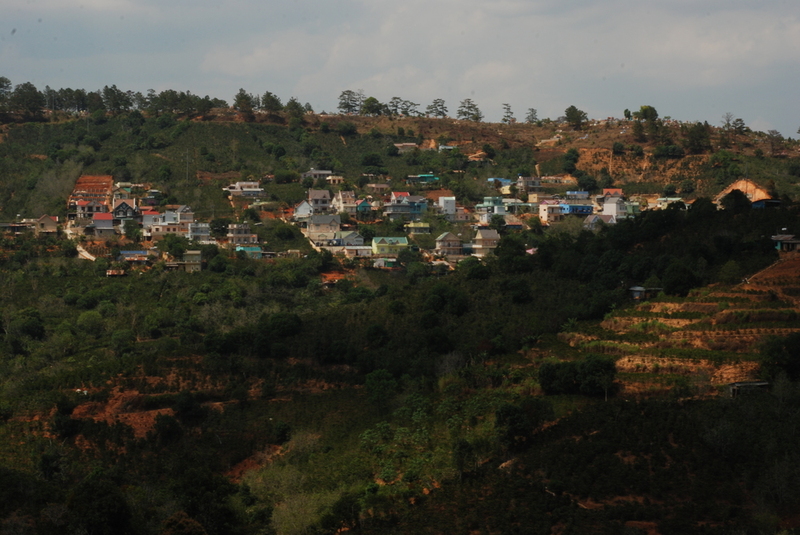 The ride into Cau Dat took me to a side of Dalat I had yet to see, full of hills and greenhouses, lakes and streams, passing through at least half a dozen hamlets on the way. I was excited to see the area, as the best lots of Typica and Bourbon (and even Catimor for that matter) that I tasted were from Cau Dat. At over 1600m asl with a mild, dry climate it is easy to see why. Not many regions in Vietnam consistently reach this elevation, making this small mountain hamlet ideal for quality Arabica cultivation. Before the government initiatives for high-yield varieties, Cau Dat had quite a bit of Bourbon, Mocha and Typica production, making a name for itself among regional aficionados. Some producers have held onto a few of these trees, rightfully believing they made their blends taste better. This trip had a few objectives: 1. Establish contact 2. Assess quality and potential 3. Make recommendations and plans for further action. Joining me were Ross Worley and Thao Thach Tran, of Children's Library International, who were in the region to assess the need for one of their library projects. Michael Wood, founder and agronomist for fi-lan-thro-pe, was also in-tow. Once there, we made contact with Mr Khanh, a local producer who is keen on always learning more about coffee and farming techniques. Mr Khanh met us at the local market and led us to his house, which was tucked into a quiet street surrounded by coffee plots. Upon entering his house, Khanh handed us a Fair Trade info pamphlet he had been studying with a few of his neighbors, saying that he planned on setting this up for himself and a small group of peers. He said that they are interested in the value-added approach, pursuing quality improvements and certifications to help make their crop worth the additional effort. After a winding, narrow-path motorbike ride, we arrived at his plot, located on the ridge across the valley from his backyard. There is an irrigation pond on-site with a system of hoses networked across the farm. About a year ago, he cleared a nice, nearly flat area for new plantings of Catimor. Some of the 2-year old trees were already producing lots of flowers, and the jasmine aroma was everywhere. Between the rows of coffee, potatoes were planted to produce a small cash crop while the trees reached production capacity (with the added benefit of breaking up the soil for microbial and moisture penetration). Right away, though, Michael noticed some issues with the young plants. Besides trees being planted too closely together, the soil is thick with clay and lacked organic matter. He also pointed out curled and sad-looking leaves, which he said was a Calcium deficiency. The plants also showed signs of phosphorus over-use, which can burn the roots, inhibiting nutrient uptake, weakening the overall plant structure. We went down into the main plot, which was full of 7-10 year-old trees planted very closely together. This is where we noticed some Typica and Bourbon trees, and Khanh could see our interest. A few trees still had ripening cherries, so we began to harvest them, looking for signs of berry borer and other pesky critters. Overall, the trees seemed pretty pest-free, and Michael recommended a few things they could do to combat what was there. We only noticed a few leaves affected, but there were signs of coffee leaf miner presence. This isn't usually a big deal as long as it doesn't get out of hand, and that they're pretty easy to find and squish in the leaves. In the farmhouse, there was a pulper and some screens, which gave us a picture into the processing practice - semi-washed (honey), pulped and put on screens in the sun for drying. There isn't enough fresh water on the farm to do washed processing, so some logistical maneuvering will be needed if he wishes to pursue this avenue (he's definitely interested). We also noticed bags of chemical fertilizers, herbicides and pesticides. The conversation began to get a little frank, and Michael began to lay out a plan for conversion to organic practices. He broached the subject by asking an older gentleman, Khanh's neighbor, if he remembered when Vietnam used traditional agriculture practices; which were organic by default, mainly because of limited access to outside inputs. The man nodded his head and smiled, saying things were rather antiquated back then. Khanh said he was spending a few thousand dollars per year on chemical inputs alone, so he was definitely interested in hearing more about the approach. Among bits about a cohesive organic composting program, Michael talked about beneficial fungi and microorganisms, and how just three people can provide enough urea to supply one hectare of land. Using chemical fertilizers, herbicides and pesticides were killing the land's ability replenish itself and provide nutrition to the crop. Excessive weeding, he says, is unnecessary because weeds can pull nutrients from the soil that coffee roots can't. Some weeds, when well-managed, can also preserve moisture by reducing evapotranspiration, providing rich organic matter when tilled under. Here's another chance to promote perennial peanut as ground cover and for the abatement of less-desirable weed growth. Chewing on these conversations, we realized that this was going to be a community effort, as the infrastructure necessary to convert to a composting program requires a little capital (which Khanh's group is willing to invest in once we divulge a plan). We'll definitely have to visit a few more times to hash out a plan before harvest begins. We headed back toward Khanh's house, to the nursery where he's propagating Catimor seedlings. 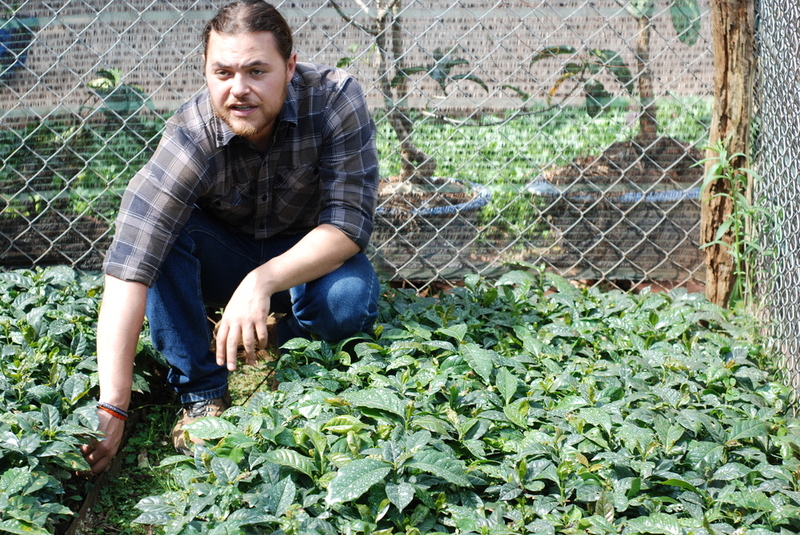 Pretty well-maintained, the nursery is lush and green with seedlings, and ideas began to develop about trying to bring back more Bourbon, Typica and Mocha seed stock from the main plot. Michael Wood, of fi-lan-thro-pe, checks out the nursery. Our next trip will be in a couple of weeks, when we'll begin to label the better cultivars and prepare for lot separation, along with further discussion of a plan for conversion to an organic composting program. This will limit the amount of chemical inputs, provide rich fertilizer and save this small group of growers thousands of dollars per harvest, all while promoting healthier soil and trees. As they gear up for Fair Trade certification, Khanh's group has the potential to make a real difference in their community, and we're glad to be useful for this effort in any way we can. UncategorizedWill Frith April 20, 2013 coffee, Dalat, fi-lan-thro-pe, friendship, hope, learning, Quang Tri, relationships, Son La, value chain, variety, Vietnam, where do I fit?